After a long, arduous winter of work, you have saved up your PTO and fly out to your dream destination for a much-needed vacation. You are miles away from the cacophony of call lights, alarms and demands of your job, and with each passing mile, you feel the stresses shed away and the beckoning call of the ocean strengthen. The plane is cruising along at an altitude of 40,000 feet as you watch a movie and daydream about the coming days, thinking about how you are going to spend them relaxing on the beach. In an instant, your moment of tranquility is disrupted by a loud banging noise and the intense pressure of frigid air rushing into the cabin. You fumble with the oxygen mask that has dropped down in front of you, trying to put it on, now remembering the words of the flight attendant instructing you to put your own mask on before you help those you are with. You don’t know this, but you have the next 15 to 20 seconds to properly don the oxygen mask before you lose consciousness. Thankfully this scenario is something that happens very infrequently; however, the necessity of being prepared for such events mandates that safety briefs are performed before each flight. Anyone who has flown can attest to how mundane these briefs are as the flight attendant goes over that very vital point of donning your own oxygen mask in the event of an emergency before helping others with theirs. This concept of prioritizing oneself in an emergency to then help others makes sense when given the rationale for why it is done, especially when reviewing the hard numbers of how much time you have before severe hypoxia kicks in. The strategy of self-prioritization can and should be extended to nurses regarding the importance of our own health and wellness as well, as the concept has universal application. Just as the aforementioned nurse on the plane is not able to help others unless first getting his or her own mask on, we all aren’t able to effectively perform our duties to the best of our ability if we aren’t first taking care of ourselves. The necessity for nurses to take care of ourselves and lack thereof is evidenced by a systematic review of literature spanning 10 years and 13 studies of U.S. hospital nurses that found fewer than 5% of nurses engaged in healthy lifestyle behaviors as measured by a healthy diet, adequate physical activity, no tobacco use, limited alcohol consumption, and a healthy weight. This review showed that the overwhelming majority of the nursing workforce is at a higher risk for cardiovascular risk factors and overall diminished health-related quality of life. The authors of this study substantiated their findings with data from the Nurses’ Health Study (NHS), which is the longest running and largest study on nurses’ health in the nation. NHS has been collecting health survey data on nurses since the 1970s and includes over 275,000 participants. Data from these surveys revealed that 3% or fewer of nurses practiced healthy lifestyles as identified by the previously mentioned behaviors in the 13 studies. These survey results are alarming and are just as harmful as the fictional hypoxic scenario described above. They are to be taken seriously not just for our own sake, however, but for our patients’ sake as well. Research has shown that nurses who practice healthy lifestyles are more likely to discuss and promote healthy preventative behaviors such as eating a healthy diet, exercising regularly, and smoking cessation with patients under their care. There is also research suggesting that nurses who get daily physical activity, eat a healthy diet, and get adequate sleep might be less prone to workplace injury and errors. With the continued climate of nursing staff shortages and the impending retirement of the Baby Boomer generation of nurses, this is all the more reason for each and every nurse to be a good steward of his and her own health to ensure our workforce is maintained. With 2018 here, many in our culture and some reading this may be inclined to set a New Year’s resolution as a way to make positive changes in one’s life. As anyone who is a regular attendee at a gym can attest to, these resolutions are popular in January and melt away as quickly as the snow. According to a U.S. News and World Report finding, 80% of New Year’s resolutions are cast aside by mid-February. A more realistic approach than a resolution that can lead to a healthier you is to do one or all of the following five things, according to psychotherapist and author Amy Morin. The key to this is to set a measurable goal that is attainable for the month. January can be the month that you decide to pack your lunch for work instead of eating out. February can be the month that you walk briskly for 30 minutes three times a week, and so on. Keep a log or calendar and write down daily records of healthy habits that you do, whether they are spontaneous or planned. Try to record at least three things each day that you did that were healthy. This will help motivate you to pursue more healthy habits. You can also create a more visual tracking method for a habit, such as using a jar and filling one marble for each time you go to the gym or go for a brisk walk. Set a goal that once the jar is full you treat yourself to something nice. Developing a mantra that you can say to yourself repetitiously can help solidify your goals and change your behavior over time. A few years ago, after being diagnosed with an acoustic neuroma and undergoing a craniotomy, I myself developed the mantra “up and over” to help me push forward through the obstacles of recovery. A mantra can be a powerful tool to help reach your goals. This is an abbreviated version of the monthly goals and offers the flexibility to try new things without the longer commitment. Using your record to track your healthy habits, try new healthy foods, or sign up for an exercise class. Think of it as 2018 offering the opportunity of 52 weekly experiments to try something new for a healthier you. Make a list of items that you want to do for the year, from big to small. Whether walking your first 5K, running your first marathon, or something in between, there are plenty of new challenges to take on in 2018. It can be as simple as taking a healthy cooking class or as challenging as training for and competing in a triathlon. You can come up with 12 items and knock off one item per month or go big and write down 52 and do one a week. Pick things that are fun and healthy and will challenge you. I’ve started my list for 2018 by wanting to enter a novice Strong Man competition at some point in the year. Each of us has been taught the nursing process and applies it on a daily basis. The research shows that we are so focused on those under our care that we have been neglecting our own health. The data has been collected and the problem diagnosed. Now it’s up to each of us individually to come up with a plan and implement it. Evaluate each week or month what works and try new things, but remember to focus on yourself and your own health and wellbeing. Whether you realize it or not, just like with the fictional airline emergency, the clock is ticking. 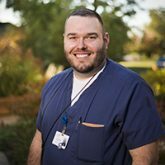 Jon Templeman is a staff nurse at Our Hospice of South Central Indiana Inpatient Facility in Columbus, Indiana. Editor’s note: Learn more strategies for nurse heath at the Healthy Nurse, Healthy NationTM, Grand Challenge website. Consider joining the challenge! Esposito EM, Fitzpatrick JJ. (2011). Registered nurses’ beliefs of the benefits of exercise, their exercise behaviour and their patient teaching regarding exercise. Int J Nurs Pract. 2011;17(4):351-356. Geiger-Brown J, Trinkoff AM, Nielsen K, Lirtmunlikaporn S, Brady B, Vasquez EI. Sleep, sleepiness, fatigue, and performance of 12-Hour-shift nurses. Chronobiol Int. 2004:29(2), 211-219. Priano SM, Hong OS, Chen, J. Lifestyles and health-related outcomes of U.S. hospital nurses: A systematic review. Nurs Outlook. 2017. Wolff M. Cabin decompression and hypoxia. n.d. https://www.theairline pilots.com/forumarchive/aeromedical/decompressionandhypoxia.php. I really enjoyed writing about the analogy Stacy, but I had not thought to use it as a hospice clinician. I’ve worked hospice IPF for the past 5 years and I often tell my little ladies whose husbands are in the bed actively dying, “don’t forget to take care of yourself.” I might need to start implementing this analogy to drive the point home! I really like the analogy. We often tell our hospice caregivers to “put on their oxygen mask first” so this comes down to taking our own advice.